Learn more abour wire fraud prevention and consumer fraud protection. Investors Title is based in Chapel Hill, North Carolina, has a regional office in Columbia, South Carolina, and issuing offices throughout the U.S. Investors Title writes and supports residential and commercial title insurance, and provides a range of related services to our industry partners, including 1031 like-kind exchanges, and the coordination, underwriting, and management of complex commercial transactions through sister companies. Innovation and creative solutions come only with experience. At Investors Title, we have built a team of highly knowledgeable experts, developed top quality educational resources, and designed technological tools that streamline and facilitate residential and commercial real estate transactions. Key to our success is our deep and abiding level of expertise: our ability to provide informed and accurate underwriting, efficient transaction execution, and exceptionally responsive claims administration. We recognize that ours is a cyclical industry, a certainty that keeps us relentlessly focused on maintaining our financial stability and profitability. Through sound underwriting practices and seasoned relationships with business partners who share our goals and values, we have stayed the course during economic downturns. Our corporate symbol is the Canada Goose. It reminds us of the qualities we emulate as we serve our customers, agents, financial institutions, and communities. The flying “V” formation of a flock of geese is an instinctive innovation that sets it apart from other species and has allowed them to thrive in a diverse range of habitats. The “V” formation represents a team effort to optimize not only the team’s aerodynamics, but control the overall speed to achieve objectives, expand the selection of habitat solutions, and provide the stability needed for them to thrive. It is our instinctively client-centric approach to developing innovative business processes and solutions that sets Investors Title apart for our partners and clients. A.M. Best has assigned a financial strength rating of A (Excellent) to Investors Title Insurance Company, designating it with "excellent ability to meet its ongoing insurance obligations." For the latest rating, access www.ambest.com. Commercial Real Estate Recommendation: Highly Recommended, the highest recommendation for commercial real estate transactions. 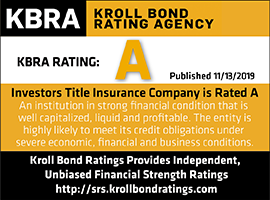 *Financial Stability Ratings® (FSRs) are a leading indicator of an insurer’s financial stability. FSRs are based upon a series of quantitative ratios and considerations which together comprise Demotech’s Financial Stability Analysis Model. FSRs are accepted by several government-sponsored enterprises, including Fannie Mae, Freddie Mac and various programs of the United States Department of Housing and Urban Development (HUD), mortgage lenders, as well as a number of umbrella and agents errors and omissions insurance markets. 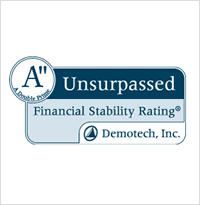 The most current Financial Stability Rating® must be verified by visiting www.demotech.com.